I began my training for the next tour last night. I went to go see ABC in a tiny venue out in Riverside, about 45 minutes from my house. To be fair, I really had no expectations of the show. While I liked ABC well enough, I wouldn’t say they were a favorite of mine, but instead one of many New Wave bands I love. When the show was announced, I knew seeing Martin Fry in a venue of 200 people was definitely worth the drive on a Wednesday night. It was a GA show in a tiny restaurant that has an area that doubles as a bar/small venue…with one of the best sound systems I’ve ever heard. My husband and I made no attempt to get to the venue early to be among the first in line, as we were coming directly from Back-To-School night for our youngest. We figured we’d secure places by the bar and just be happy to be there. When we arrived, there was quite a line filled with 40 (and 50)-somethings ready to have a party. I couldn’t get over the amount of women who had absolutely no idea that they (and their bodies) were no longer in their twenties. I’ve seen some questionable attire at Duran shows before, but I have to say, this crowd topped whatever I’d seen prior. We got in line, and before long were in the venue, hanging out in the bar with drinks in hand. Richard Blade was the DJ (and worth the price of admission on his own) pre and post show, and he was already onstage doing a few contests for tickets to the Depeche Mode convention here in So CA in November. It wasn’t long before the opening act came on stage. This was Matt Backer, who is also the guitarist for ABC. Matt plays rock & blues, in a similar vein to Dom’s solo music, or even some of the music he plays in Blue to Brown. I heard a few 12-bar blues progression songs, but then he’d turn around play something that I can only characterize as a mixture of say, “pick your favorite Pearl Jam song and ‘I am The Walrus’ by The Beatles”. His closing number (and I’m sorry but I never did catch the name) sounded like a direct rip-off of “Addicted to Love”. I didn’t think it sucked, but on the same token I didn’t think his music was all that innovative or original either. Once Matt Backer’s band left the stage, it was time for ABC. Martin Fry looked every bit the gentleman as he came out on stage in his suit and tie, and he seemed very pleased to be there. His hair is a little more reddish than I remember, but otherwise there was no mistaking him. His voice is as strong as it ever was, and it was a lot of fun singing along with him. While his show isn’t quite as energetic as say, Duran Duran’s…it still fulfilled my New Wave fantasies. I mean, who would have thought I’d ever have a chance to see Martin Fry live?!? I believe we heard all of the main ABC hits, such as “Poison Arrow”, “Millionaire” (I’d forgotten about that one and it was fantastic hearing it live!! ), “Be Near”, “Look of Love”, “Smokey Sings”, and the list goes on. It wasn’t the longest set ever, but it was a quality show in every way. Martin looked pretty spent when he was done, and I came away from the show thinking that I was pretty lucky to have had the chance to check THAT box on the bucket-list. Truthfully though, the real fun of the night for me came AFTER the show. Richard Blade came back out to DJ, and I went straight to New Wave heaven. I danced to everything from “Girls on Film” (that was before ABC came out) to TransX “Living on Video” (one of my secret, guilty favorites of the 80s). Many of my friends know, but I met my husband at Fashions on the Redondo Beach Pier in March of 1992. Richard Blade used to guest DJ there for KROQ nights on Friday or Saturday, and that particular night was the 10th anniversary of KROQ being there. I stood in line outside with a friend of mine talking with one of his friends until we got in the club, and at that point I was introduced to my-now husband. Since that night, we’ve always attributed (or blamed, depending upon how we’re feeling at the time!) our meeting to Richard Blade, so last night was a chance for us to have fun and remember why it was that we actually got married and have three kids and a crazy, stressful life. 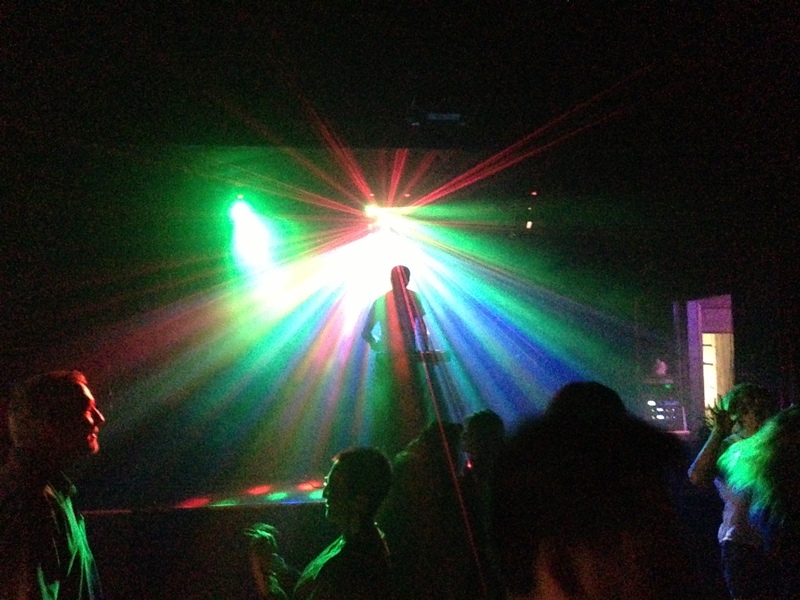 We left the club after 1am, came home…and now I’m paying for dancing and being out late, but it was worth it. Silhouette of Richard Blade doing what he does best – spinning 80s music! I think last night just reminded me how lucky I was to have grown up and become an adult in the 80s/90s. We had great music, fun clubs to go to, fantastic DJs….and our world felt a lot safer then than it does right now. I guess I escaped the rigors of life a bit as I danced on that floor, and I have to say, I’m ready to do it again…just as soon as my medication kicks in and my knee forgets that it’s in it’s 40’s.